Tonight the first Eurosong 2014 semi final took place in Vilvoorde with two of the four songs making it to the March 16th Final to be staged at the Sportpaleis Antwerp. After the combined jury and public vote Eva Jacobs and Udo were the top two of the night. 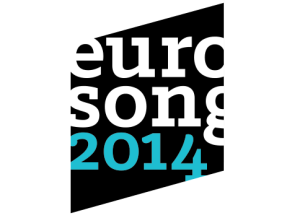 Across the three Eurosong 2014 semi finals four artists will perform their new songs to the audience. After they have been ranked by the panal of experts in the studio the phone lines open and the public have their say. Each night the songs will be available to download right after the broadcast. Semi Final (Tuesday May 6th) in Copenhagen. Tonight the first four took to the stage and our get to know article has all the details on these talented performers. Day One are a four piece act that wear facial masks, designed in a multi angled fashion that shield their faces from the people. The lead singer is female and the other three are male who play guitar and drums and their song Whoever You Are is a good opener to the show. The members of the group Day One are styled in dark clothing with the lead singer wearing a black feather shoulder dress which is quite atmospheric to the performance. It’s edgy, it’s modern and this isn’t stereptypical Eurovision at all. The beat kicks in and is strong throughout. The masks and the boxes worn by the band with tablet screens depicting showing faces of world figures on the back three members of the band are quite distracting and while there is a big talent here I think this sone is a grower and not an instant hit on first listen. They prove very popular in studio and receive 90 point average from the panel. A very talented performer, Eva has great vocals and has an element of the likes of Alicia Keys or Nicole Scherzinger about her. Eva starts the song from behind the piano as her three female backing performers vocally harmonise with her. On stage are a male and female interpretive dance couple who tell the story of the song through dance. It certainly adds a further dimension to the whole thing. Eva is looking beautiful with a large showy ball gown/prom red dress which has a flounce to it and a slight trail. Nothing is Impossible has a really warm and strong message and after their comments 91 is her average score from the panel. Udo and his five strong backing group give it their all with this song, a message of laying down your weapons and ending of war. He wears a blue suit and has quite a high quiff hairstyle. The backing group of two singers and three further interpretive dancers in white all performers on stage give the extra feeling to this, if a tad overly performed. At one moment Udo is even raised up by the support performers, going a bit too far. Less is more I say. They have a white flag, the backdrop on stage is poppies. I can completly understand the expression of the song but I’m not sure this is the song for Belgium 2014. On the panel a comment is made that the choras is similar to Celine Dion’s Ne Partez Pas San Moi. Ruslana is quite emotional when she gives her critique of the song, says with the current situation in Ukraine she really feels from the words. The entry gets 75 from the average score of the panel. From the off I felt this was going to be uber fabulous. The Lady Gaga of Belgium; however didn’t quite do it for me. The song begins with light up letters KILLER at the back of the stage. She is on stage with three female backing artists who are on a journey with her like four little red riding hoods. Two big bad wolf male dancers are there throughout as the play things. The song is cute, it’s a little sassy, and has a jazzy burlesque type elements to it but I just think it’s all a little too messy and nothing new at this stage. Petra has had a number of Eurovision attempts before this. Maybe next year will be the one for her. Ruslana said the performance took the lead and vocals suffered. She got 75 points on the vote from the panel to tie with Udo. Our hosts for Eurosong 2014 are Peter Van de Veirs and Eve Daeleman who tonight introduced our four acts and kept the show going in a very professional manner. Peter wears a navy tailored blazer with grey skinny jeans with Eve in a white satin sheen top and light blue tone knee skirt with a very nice accept modern broch on her lapel. The studio is very impressive with the jury panel on the side of a large LED screen backed set. During each performance the backdrop can be changed to great effect and is enhanced further by the lighting. Beween the songs Peter and Eve take it in terms to go to the side of studio green room with the acts all seated and watching and awaiting their fellow contestants to perform. Roberto Bellarosa returned to reprise his 2013 entry Love Kills flanked by two female dancers while the public vote lines were open. Eurovision 2004 contest winner Ruslana of the Ukraine, Piet Goddaer, Bart Peeters, Jef Martens are on hand to give a critique and their points which are the average score of their individual points out of 100 to the four semi finalists. As well as the in studio jury panel the viewing public has 50% influence on the result. After the initial scores from the panel the order was: Eva Jacobs on 91, Day One on 90 and Udo and Petra on 75 points. and forth place is Petra. Belgium is one of the original competitors in the contest having taken part in the very first Eurovision in Lugano in 1956. To date they have achieved one win, in 1986 with Sandra Kim and J’aime La Vie. There are two large regions in Belgium that split the country: French speaking Wallonia and the Flandern, where Flemish is spoken. With the region split comes seperate broadcasters also, namely RTBF and VRT. The broadcasters take it in turns to participate in the song contest. Since the introduction of the Semi Final’s Belgium has experienced some disappointments as they attempted to advance to the final of the Eurovision. From Kiev 2005 to Moscow 2009 and again from Dusseldorf 2011 to Baku 2012 they didn’t make it out of their respective semi finals. However they successfully got to the final in Oslo 2010 with Tom Dice who sang Me and My Guitar which finished a very respectible 6th place. Further promise was shown last year when Roberto Bellarosa got to the Malmö Final with the song Love Kills and finished in 12th place.